Ultra-Lite Series Gauges have become the most popular gauge of the Auto Meter lineup due to providing quick and accurate readings through their race-proven core instrumentation. These lightweight gauges are engineered to withstand racing conditions and enable you to customize the look of your dash. Each gauge features traditional incandescent lighting that illuminates around the perimeter of the dial and has a silver satin anodized aluminum gauge face with black accents. Ultra-Lite digital, electrical and mechanical gauges fit perfectly in any street or race-driven vehicle. 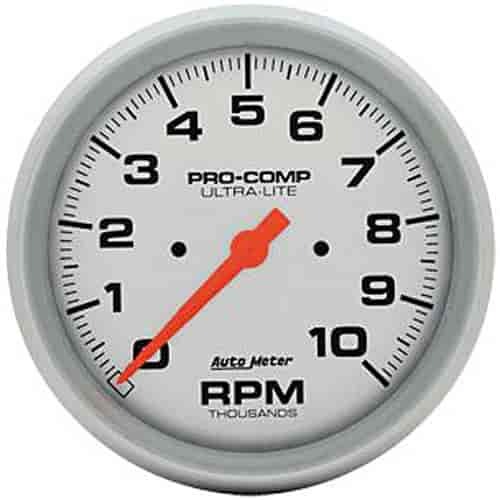 Auto Meter Ultra-Lite Elite Digital Gauges enable you to toggle between two separate readings on a single gauge. You can quickly assign parameters for each reading by using the buttons on the front of the gauge. These high-end performance gauges also allow you to program warning points that will cause the display to blink in the event of a critical reading. 0-5 V Analog Output Shares Values to Data-Loggers, ECUs, etc.